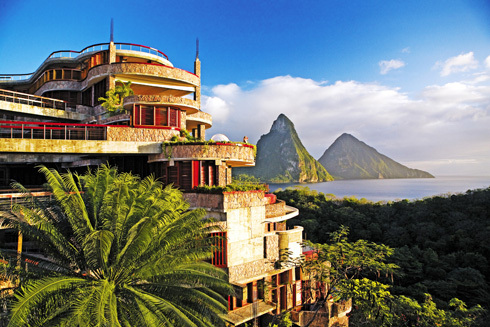 Mount up for a ride on Saint Lucia's wild side. In a wooded seaside valley near the iconic Piton mountains, a network of jungle trails loop through the ruins of a former sugar plantation and climb into the nearby hills. There is something for cyclists of all levels. Novices and casual riders can make easy peddles on groomed trails to visit historic buildings, waterfalls and groves where fruit trees are decorated with wild orchids. Cyclists seeking greater challenges can head for the slopes, where switchback routes climb high to reveal sweeping views of the Caribbean. Off-road bike riding in Saint Lucia centers around the Anse Mamin Plantation, which is part of the 600-acre estate belonging to the Anse Chastanet Resort. Here, eight miles of off-road bike trails run through jungle foliage and the abandoned stone structures of a French sugar plantation. All trails are mulched to reduce mud and prevent erosion. Roots and other sharp projections are removed, and there are routes suitable for novices to experts. If you're new to off-road biking, be sure to sign up for the Introductory Skills Class, which teaches proper pedaling techniques, easy ways to improve balance, and turning, plus the skills of riding up and down hills and negotiating gullies and roots. The Sawe route meanders through a jungle ravine to reach a shaded riverside glen. Near the Old French Sugar Mill, a network of rider-friendly trails wind through orchards of mango, guava, banana, cocoa, citrus and breadfruit. Just up the hill, a stone dam creates a cool swimming hole in the jungle. The steep uphills and tight switchbacks of Tinker's Trail will challenge expert riders. A fanny pack is the best way to carry small items such as snacks, sunscreen and bug repellent while riding, as backpack straps may snag on branches. Place cameras, phones and other moisture-sensitive devices in a waterproof pouch or case, and leave larger items at the center’s headquarters. 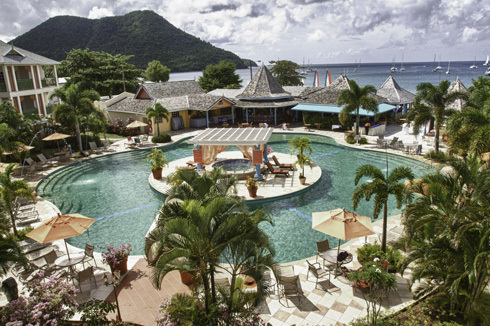 CASTRIES - CARADONNA RECOMMENDS 7 night Luxury accommodations, breakfast, lunch and dinner daily including beverages and wine served with lunch and dinner, one 50 min treatment per day from select menu including fully customizable wellness experience, free WiFi, roundtrip airport transfers, hotel tax and service charges. Valid 7/1/19-8/30/19. Book by 5/28/19. CASTRIES - BUILD YOUR OWN PACKAGE includes 7 night luxury accommodations, breakfast, lunch and dinner daily including beverages and wine served with lunch and dinner, one 50 min treatment per day from select menu, holistic classes including yoga, pilates and t'ai chi, biking tours, free WiFi, roundtrip airport transfers, hotel tax and service charges.